Defending champions Germany were knocked out of the 2018 FIFA World Cup at the group stage against all odds. Manuel Neuer had shaken off a foot injury to be fit in time for the tournament while a Marco Reus returning to full fitness was preferred to Manchester City’s Schalke-hewn prodigy Leroy Sane… bundesliga.com takes a look at the players that got Joachim Löw’s men to Russia, and who the coach leant on once they got there. First among those was the 4-2-3-1 formation that has been the formation du jour in German football for the last few years. Familiar faces from the 2014 triumph in Brazil racked up the minutes – Mats Hummels and Thomas Müller started eight and nine games respectively – while their Bayern teammate Joshua Kimmich removed any doubts that he would be the natural successor to the retired Philipp Lahm at right-back, scoring two and providing a team-high nine assists. Löw initially wrestled with who his first-choice centre-forward as with a Miroslav Klose-shaped gap to fill, though. Mario Götze, Sandro Wagner and Lars Stindl started three games apiece. Götze played the most minutes with 323, Wagner scored the most goals with five, yet none of the three went to Russia. Stindl tore ankle ligaments, while others were preferred to Götze and Wagner. Brandt played 90 minutes all three times that Löw elected to play with his widest possible midfield. With Müller inside him, it was the Bayer Leverkusen man who hugged the touchline. Kimmich was trusted to fill in as a third centre-back although he spent the majority of the campaign overlapping, with Stindl’s Borussia Mönchengladbach teammate Ginter on the other side. With San Marino and Azerbaijan currently sporting FIFA world rankings of 205 and 105 respectively, it’s perhaps unsurprising that some of the players used to dismantle them failed to make the cut for Russia. Juventus midfielder Can, Arsenal defender Shkodran Mustafi and Ajax winger Amine Younes joined Wagner and Götze on the sidelines. Brandt’s ability to play across the midfield punched his ticket to Russia ahead of Sane, meanwhile. Cut from provisional 27-man squad: Bernd Leno(Leverkusen), Nils Petersen (Freiburg), Jonathan Tah (Leverkusen), Leroy Sane (Man City). The top-scoring German in the Bundesliga last season with 15 goals, Freiburg’s Nils Petersen was a surprise call-up to the provisional 27-man squad in the weeks leading up to the Finals, but Löw ultimately preferred veteran VfB Stuttgart striker Mario Gomez. Phillip Max ended the season just gone as the Bundesliga defender with the most assists since records began, usurping Lahm, but the Augsburg could not displace Hector at left-back – a player relegated with Cologne but whom has never let Löw down in 37 caps. Neuer, Reus and Jerome Boateng all found fitness in time. Müller was and is the top scorer among active players at World Cup finals tournaments with 10 goals. Die Mannschaft were locked and loaded. Mexico took a 35th-minute lead through Hirving Lozano, but Löw stuck to his guns until the hour mark, when final third operator Reus came on for defensive midfielder Sami Khedira. Striker Gomez replaced left-back Plattenhardt with a little more than 10 minutes to go as Germany’s formation got progressively more attacking, but by the time Brandt replaced Werner the game was lost. With Sweden Germany’s next opponents, would Löw stick to the old adage of not fixing something unless it was broken? How broken was it? Germany had twice as many shots as Mexico despite the 1-0 reverse. Further forward, Reus was given a maiden World Cup start ahead of Özil, who had begun each of Germany's previous 26 matches at major tournaments. The Borussia Dortmund forward's inclusion was vindicated. Reus put in a livewire display and scored to cancel out Ola Toivonen’s opener early in the second half. Toni Kroos then scored a stunning injury-time free-kick to give Germany all three points. With three points on the board, Germany’s progression rested on the final match against South Korea, and Löw again played to his team's recent strengths. Boateng was suspended, so Niklas Süle was drafted in at centre-back alongside Hummels. For the most part, the rest of the team picked itself, while Leon Goretzka was preferred to Müller in the withdrawn attacking role behind Werner on the right-hand side. With the hour mark approaching and no opening goal in sight – by which time Sweden were already leading Mexico and on course to join the Central Americans in the last 16 – Löw began to send on the attacking reinforcements. In the space of 20 minutes, Gomez (striker), Müller (forward) and Brandt (attacking midfielder) replaced Khedira (defensive midfielder), Goretzka (attacking midfielder) and Hector (left-back) as Germany’s formation got progressively more attacking. Despite Germany coming close, it was South Korea who found the target with a pair of injury-time goals – both scored on the counter – thanks to Young-Gwon Kim and former Leverkusen hero Heung-Min Son. That accounts for the future, but what about the here and now? 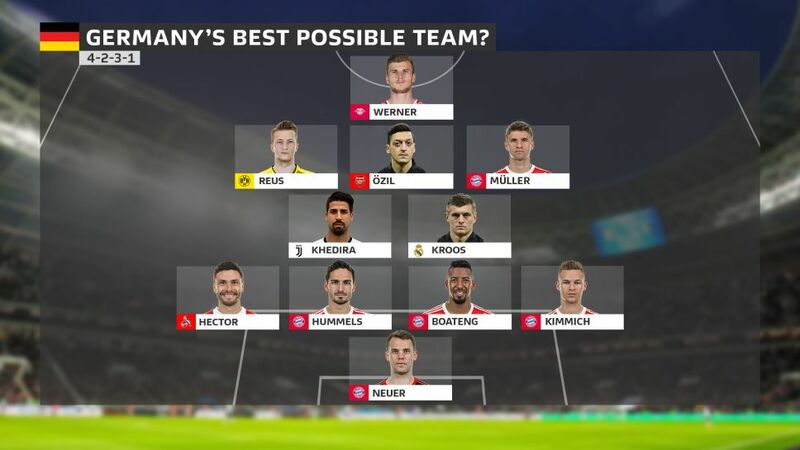 If there were any lingering questions on Germany’s strength in depth, how about the above for a team of players who didn’t even get on the plane to Russia? How quickly Die Mannschaft bounce back remains to be seen. Löw may not have got his selections dead right this time; although perhaps luck simply deserted him. One thing is for certain though: with the embarrassment of riches outlined above, the German national team shouldn’t be licking their wounds for long.